Hi, I’m Becca. And I rewrote this bio about six months after I left my sweet little apartment and stellar job in Brooklyn. Since then I’ve chopped off all my hair, contracted and recovered from typhoid, and taken thousands photographs. This trip has introduced me to a continent worth of new cultures, taken me places I never dreamed of going, opened my eyes to issues I didn’t know existed, and sparked my love for the underwater world. I’ll be back in the states in April, until then don’t call me, but you can find me on Flickr, Facebook, Twitter, and LinkedIn. 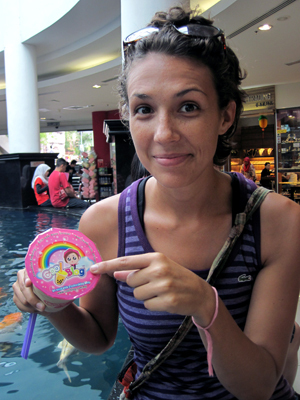 And the photo, just for the record, is me with a “cool blog” at a mall in Malaysia.